head of her PLATINUM SOUL appearance in Aspen this weekend, Top Chef STEPHANIE IZARD is serving up a show-stopping spring dish. Get the recipe, here. SoulCycle is teaming up with American Express this weekend as a part of the Food & Wine Classic in Aspen. Top Chef winner and restaurateur Stephanie Izard is joining SOUL Master Instructor Rique Uresti for the PLATINUM SOUL collaboration, bringing next-level classes and bites to Colorado. In celebration of her trip to Aspen, Izard is sharing a gorgeous, vitamin-packed dish for spring. 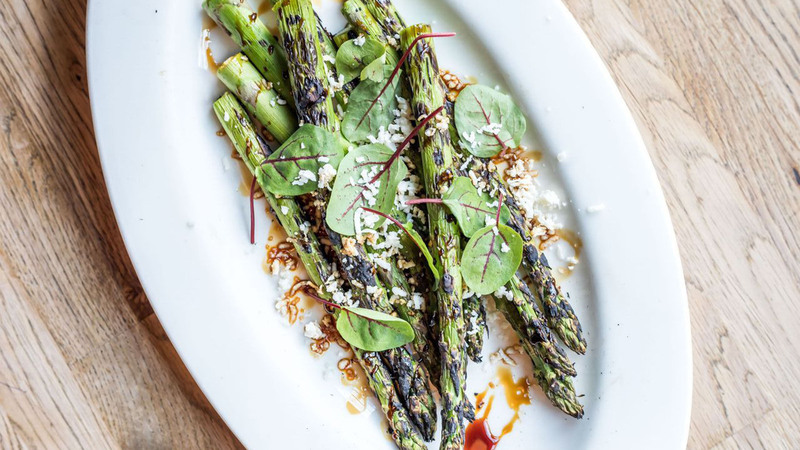 "This is one of my favorite vegetable dishes to eat in the spring when you can find fresh asparagus at the farmers market!" Izard tells SoulCycle. "Besides being a tasty vegetable, the asparagus in the dish is high in antioxidants, especially if you use purple asparagus! It's also really high in vitamins A, C, E, K, and B6, as well as folate, iron, copper, calcium, protein, and fiber. Asparagus is a great spring super food." Preheat grill to medium-high. In a medium bowl, toss asparagus with oil. Set asparagus horizontally across hot grill grates and grill until tender, 5 to 7 minutes, turning once or twice. Let cool slightly, then cut spears into 2-inch pieces. Return to bowl and add Tokyo sauce. Toss to combine. Transfer to serving dish and top with crumbled cheese. Chef's Note: If you are serving a crowd, you can blanch the asparagus for 2-3 minutes in boiling water and hold in the fridge, it will cook in half the time on the grill. If grilling is not an option, roast in a 350-degree oven for 20 minutes. Learn more about PLATINUM SOUL in Aspen HERE. Feeling inspired to ride? Purchase a series HERE.